The first link is an older post from Science Education on the Edge, but the Halloween ideas within are perfect. Imagine Physics teachers and students designing ways to dispose of all the pumpkins we’re left with after Halloween. Now, think of all the scientific properties that would be discovered in building a trebuchet or simply blowing up a few pumpkins. Sounds like a good way to study Physics and a lot of fun. Is your school jumping on the iPad bandwagon this fall? Teacher Reboot Camp has a great list of apps for iPads, iPhones, and iPods. Most of the apps are Halloween games, but a good teacher can find some great classroom applications or just give the students a brain break now and again. Edgalaxy has a couple of useful posts for Halloween. Try having students create a choose your own adventure story using a PowerPoint template. Or check out these five fun classroom ideas for Halloween. For those who maybe want to research Halloween or practice reading infographics, Daily Infographic has several interesting infographics. There’s the Costume for Every Era graphic that demonstrates how students can create costumes based on historical eras. For students who are older and ready for the Dark Side of Halloween, there’s an infographic available. An economics lesson can stem from this “Candynomics” graphic. Check out the graphic below for another example and keep an eye out for whatever DI comes up with next. The Learning Network blog at the New York Times is prepared for Halloween. In one post, they ask students what they are afraid of. Look to see some of the student responses and have your own students participate. It might be the opening for a new topic in your class. In another post, a picture slideshow is used to spur on a research project on Halloween. Questions, procedures, and even resources are provided. Even if you don’t use the lesson, some of the linked resources can be helpful. Of course, if you still haven’t found what you’re looking for, there is always Larry Ferlazzo. 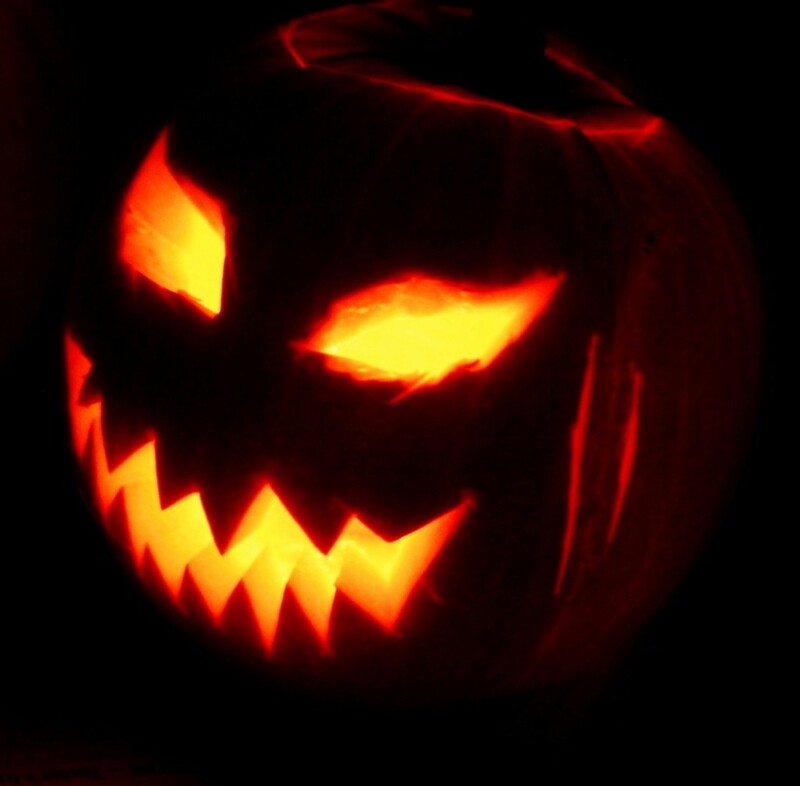 His post on “The Best Websites for Learning About Halloween” contains a huge number of resources to get you started with some Halloween-related studies in your classroom. What are your plans for Halloween in regards to your students? What are some Halloween resources we may have missed? Of course, what are you planning to be this Halloween? Zac Early is an instructional specialist with the eMINTS National Center. He does not currently have a costume, but his three-year-old plans to dress up as Rosie the Riveter. EdGalaxy is offering to buy your teacher resources and lesson plans. That’s right. You can actually profit off of the hard work you put into teaching your students…I mean, other than your actual salary. To submit a resource or lesson plan, go here to EG’s submission form. We’ve provided resources for creating infographics before, but Wild Apricot my have just created the mother of all how-to-make-infographics blog posts. In the post, blogger Rebecca Leaman points readers to some good resources for creating infographics as well as some useful tools. Although several years old, this piece on standards-based grading just appeared in my Delicious feed. Author Patricia L. Scriffiny presents seven reasons to make the switch to standards-based grading that no educator can argue. Along with her reasoning, Scriffiny provides some concrete examples sure to convince any skeptics of this new direction in grading. Larry Ferlzzo is a regular contributor at Education Week. He invited some contributors to take on the issue of perceived disrespect directed at teachers these days. Some of the insights are rather thought-provoking and invite more contributions to the discussion. Dan Meyer of dy/dan points us in the direction of this really interesting piece on relating math to the real world. Shot down are our typical answers to the question “When are we going to have to know this?” Samuel Otten breaks down each type of real-world example we typically give students and provides an idea for changing the way we teach math in order to make it more real world for our students. Courtesy of Wikimedia Commons - Click for copyright. The new school year is quickly approaching. Many of you are already sitting through professional development sessions or readying your classrooms for the arrival of young minds ready for molding. There are two educational technology experts everyone should follow. The first is David Warlick and his incredibly thought-provoking blog 2¢ Worth. In this blog, David likes to describe his travels as he works with teachers all over the country. Within those narratives, themes and invaluable insight are shared. The other blog to follow is the new Tumblr by Will Richardson. Richardson, like Warlick takes on the many issues teachers face in reaching the student of the 21st century. Both blogs give plenty to think about and inspire new approaches to teaching with each new post. With each new year, we find that our equipment and software are also a year older. Technology that worked well five years ago has suddenly started to show its age. On top of that, there just isn’t the staff or resources to upgrade technology in your school or district. In Edgalaxy‘s letter of the week, plenty of practical solutions for refreshing the technology in your district are offered. Following their tips, one can see the light of the end of the tunnel that is a long school year with outdated technology. Over at School Library Journal, there’s an interesting take on fair use and copyright. It seems that as long as materials are used in a transformative manner, educators are generally protected from coyright laws. for example, using a television ad to study body images in the media is an acceptable use. Read the rest of the piece to get a full picture of what the author is saying on this hot-button topic. Copyright and fair use are certainly important considerations as one begins to choose the media he or she will use this school year. Looking for some new lesson plans to spice up your 2011-2012 class? Look no further than the lesson plans provided by The New York Times. There are lesson plans for all subjects across the curriculum available for your perusial. Most, if not all of the lessons tie in the country’s most read newspaper so that you can make those real-world connections with your students. That should be enought to get you started for the year. What are you reading to get you inspired? What new tools or resources have you discovered that you’re willing to try this school year? Zac Early is an instructional specialist with the eMINTS National Center and he’s ready to get starte! eMINTS staff are in meetings all week. So, these posts are being written before, during, and after these meetings. 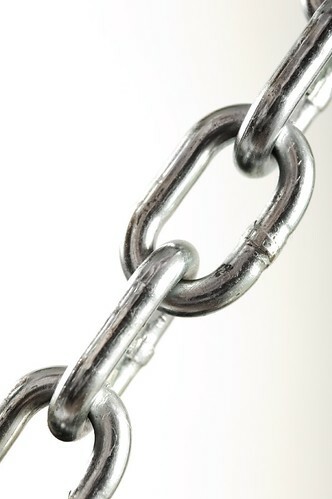 For today’s list of links, we present five interesting and useful resources for your perusal. Enjoy. 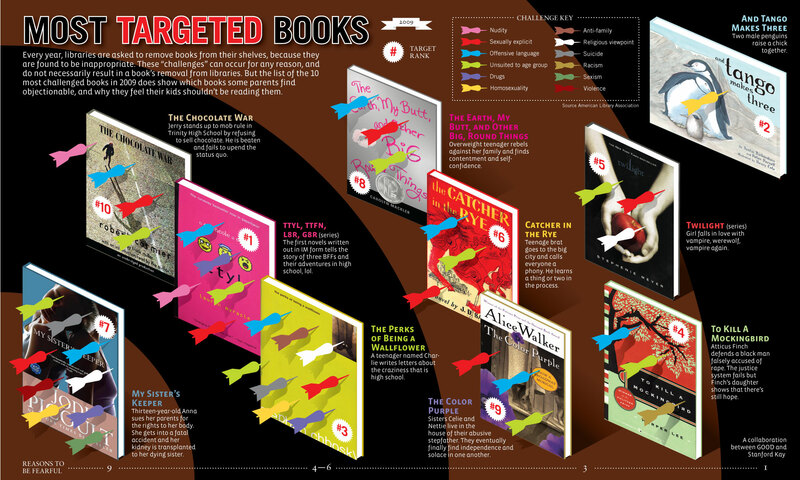 Daily Inforgraphic‘s graphic today is “Most Targeted Books.” The titles featured in this inforgraphic are those most targeted by parents for concerns over questionable content. Some old favorites like Catcher in the Rye and To Kill a Mockingbird still worry parents, while newer, popular titles like Twilight cause concern. The infographic originates from the “good” folks at Good, also a great resource for infographics in their own right. The Learning Network blog at The New York Times has a post today that asks some interesting questions about how we identify ourselves ethnically on college application and financial aid forms. The questions are paired with a Times‘ article on the same topic and stir up some interesting issues that don’t provide black and white answers. Edgalaxy features The Science of Cooking‘s cooking candy resource. Not only is candy making a fun (and sweet) art, but there is some science involved that will either make or break yummy treats. For those looking for new ways to share documents with students and colleagues via your website or blog, Embed.It has the answer. You can upload up to 20 MB in the following formats: Documents (Word, Excel, PowerPoint, WPD, ODT, ODP, ODS, PDF); Images (GIF, JPEG, PNG, TIFF, BMP, PSD); Vector Graphics (API, EPS, PS); Text (TXT, RTF, CSV); Code (HTML, SQL, JS); Web (Web pages or other URLs). Just upload your file and Embed.It will give you a handy embed code to plug into your site’s HTML. Finally, here’s an end-of-year video for one fifth grade class that looked to have a pretty fantastic year of learning. Gifted teacher Jason Smith of West Chatham Elementary School in Savannah, GA has pieced together a pretty slick look back on his year. Maybe it will spark some ideas as you plan for the coming fall.